Walker-Kimbrough provided four points (2-2 FG), one rebound and one steal in Thursday's playoff victory against Los Angeles. In just under three minutes of action off the bench, Walker-Kimbrough made the most of her time and dropped four points on a perfect shooting performance. In 19 regular season games, the second-year guard posted 3.5 points per contest this year. Walker-Kimbrough tallied two points (1-1 FG) during the win over Seattle on Thursday. Walker-Kimbrough played a mere 39 seconds during the blowout win Thursday and added to the slaughter by draining her only field-goal attempt. Across 18 appearances this year, Walker-Kimbrough is currently averaging 9.1 minutes per game while contributing 3.5 points. Walker-Kimbrough chipped in seven points (2-6 FG, 1-2 3Pt, 2-2 FT), two steals, one rebound and one block in the 88-60 blowout win over the Sky on Tuesday. Walker-Kimbrough's back-to-back outings of seven points is the most she has scored during a two game span so far this season, as she managed to shoot 40.0 percent overall from the field Tuesday. The second-year guard is currently contributing 4.1 points and 1.2 rebounds off the bench in 2018. Walker-Kimbrough had two points (1-2 FG) and one block in Tuesday's 81-77 loss at Seattle. Walker-Kimbrough was once again a non-factor during Tuesday's loss as she only managed two points. In five games played this season, the second-year guard is averaging just 10.0 minutes, 3.6 points and 1.0 rebound. Walker-Kimbrough did not score (0-1 FG) but added one rebound and one block during Tuesday's 75-70 victory over Las Vegas. Walker-Kimbrough was a non-factor in Tuesday's match-up as she missed her only shot attempt and played only seven minutes. The 22-year-old guard will likely continue to play a minor bench role for at least a majority of the 2018 season. Walker-Kimbrough collected 14 points (5-10 FG, 2-4 3Pt, 2-3 FT), five rebounds, two blocks, one assist and one steal across 25 minutes during Tuesday's 86-76 win over the Sun. With fellow guards Natasha Cloud (hip) and Tayler Hill (knee) both sidelined for Tuesday's affair, Walker-Kimbrough was given extended run compared to her usual 12.3 minutes per game and responded well. She came up just two points shy of matching her career high, though did manage to post career highs in rebounds and blocks. The 5-foot-11 rookie out of Maryland seemingly makes for a nice low-cost flier while her teammates are out with injuries, though can probably be avoided once Cloud and Hill return. Walker-Kimbrough finished with a season-high 16 points (7-9 FG, 0-1 3Pt, 2-3 FT), one assist and one rebound across 18 minutes during Wednesday's 95-62 blowout loss to the Sparks. Just one game after setting a season-high 13 points, Walker-Kimbrough stayed hot Wednesday, surpassing that total to set a new high. Her inconsistent workload has made her a fringe DFS option all year, though she's seen at least 16 minutes in each of the past four games, providing more value than usual. That said, she can likely still be avoided in most cases until she garners more minutes in general. Walker-Kimbrough provided a season-high 13 points (2-6 FG, 2-3 3Pt, 7-8 FT), two steals and one rebound across 26 minutes during Saturday's 100-80 victory over the Fever. Walker-Kimbrough's 10.2-minute-per-game workload has been inconsistent all season, making her a fringe DFS option at best. However, she was given more than double that workload Saturday and responded with season-high 13 points. While it was certainly an impactful fantasy performance, she should likely continue to be avoided until her workload becomes heavier and more consistent. Walker-Kimbrough is averaging 2.4 points, 0.7 rebounds and 0.4 assists heading into the All-Star break. Walker-Kimbrough is seeing just nine minutes per game, and until the rookie sees more consistent time on the floor, she shouldn't be considered much of a DFS candidate. Walker-Kimbrough recorded three points (0-1 FG, 3-4 FT), one rebound and one assist across 18 minutes in Sunday's win over the Dream. It was the first start of the rookie's WNBA career, and while she did play a career-high 18 minutes, Walker-Kimbrough failed to be very productive Sunday. Since her WNBA debut where she scored an efficient 10 points in 14 minutes, Walker-Kimbrough has scored a total of just five points over her last three games. While the start to the season was an encouraging one, the rookie can now be safely avoided as a fantasy option for the time being. 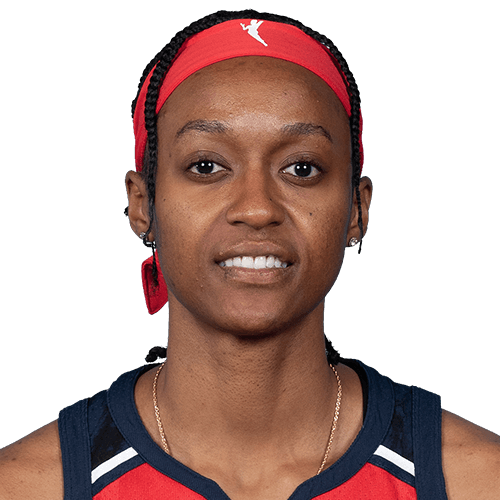 Shatori Walker-Kimbrough (born May 19, 1995) is a guard for the Washington Mystics. She played college basketball at Maryland. International Experience: Selected to USA Basketball’s Pan American Games Team in May 2015…Team took silver in Toronto…averaged 10.2 points, 2.6 rebounds with nine steals and seven assists through the five-game the tournament and started the final three games. As a Senior (2016-17): Named to the Preseason All-Big Ten Team, ESPNW’s No. 4 Player in the Country…Senior CLASS Award finalist…earned unanimous All-Big Ten First Team and All-Big Ten Defensive Team honors… named to the South Point Shootout All-Tournament Team…went 9-9 at the line and led team with 26 points, 3 assists, 3 blocks in win at #7 Louisville (Dec. 1)…scored 9 points with 3 assists and a steal vs. UMBC (Dec. 4)…added 19 points off 7-8 shooting, 2 threes, 3 assists, 2 steals and a block vs. Towson (Dec. 6)…scored 16 points with 2 boards, 2 assists vs. Saint Peter’s (Dec. 8)…added 17 points with 4 boards, 5 assists, 2 steals and a block at Loyola (Dec. 12)…scored 17 points with 5 boards, 5 assists, 2 steals in homecoming game at Duquesne (Dec. 21)…added 10 points with 5 assists, 4 boards and a block vs. #1 Connecticut (Dec. 29)…added 22 points, including a 7-0 run herself late in the second half, with a career-high 10 assists, 2 boards, 4 steals at Minnesota (Jan. 1)…went 7-11 from the field with 3 threes for a team-high 19 points, 7 boards, 3 assists and 3 steals at Nebraska (Jan. 4)…led team with 18 points, 3 steals, 3 boards and an assist vs. Northwestern (Jan. 7)…added 16 points with 4 boards, 2 assists, 2 blocks and a steal vs. Penn State (Jan. 11)…scored 22 points, 20 in the second half, with 5 assists, 4 boards, two steals and just 1 turnover at Iowa (Jan. 14)…added 17 points with 8 boards, 4 assists, 3 blocks and 3 steals in win over Michigan (Jan. 19)…added 17 points with 6 boards, 3 assists, 2 steals and 2 blocks vs. Rutgers (Jan. 22)…scored 14 points with 9 boards, 2 assists, a block and steal at Illinois (Jan. 26)…scored 18 points with 5 boards, 4 assists, 2 steals and a block vs. Iowa (Jan. 29)…added 12 points with 3 boards, 2 steals, 2 assists and a block at Purdue (Feb. 2)…led Terps with 23 points, including a 70-foot shoot at end of the third, with 4 boards, 2 assists and a block at Indiana (Feb. 5)…went 10-19 from the field for season-high 29 points off 6 threes, 5 boards, 6 assists and 3 steals vs. Illinois (Feb. 9)…went 9-18 from the floor with 3 threes for 24 points, 4 boards, 3 assists and a steal at Michigan State (Feb. 12)…named Naismith National and Big Ten Player of the Week (Feb. 13)…went 8-9 from the field for 22 points with 5 steals, 3 boards, 2 assists vs. Wisconsin (Feb. 15)…hit 4 threes for 29 points with 5 assists, 5 boards, 3 steals and 2 blocks at #12 Ohio State…became fifth Terp to reach 2,000 career points in that game (Feb. 20)…went 10-17 for 27 points with 6 assists, 3 rebounds, a block and an assist vs. Minnesota (Feb. 26)…went 11-15 from the field with 6 threes for 28 points, 16 in the third quarter, with 3 boards, 3 assists vs. Minnesota in Big Ten Quarterfinals (March 3)…scored 22 points with 5 boards and 4 assists vs. Michigan State in Big Ten Semifinals (March 4)…added 7 points with 3 boards, 3 assists and 2 steals in Big Ten title game (March 5)…named to All-Big Ten Tournament Team after averaging 19.0 points, 3.7 rebounds, 3.3 assists and shooting 53.3 percent from three in the three-game stretch…went 12-18 from the field for 28 points with 5 steals, 2 assists and a rebound vs. Bucknell in the NCAA First Round (March 17)…scored 19 points with 4 assists, 3 boards, 2 blocks and 2 steals vs. #22 West Virginia in NCAA Second Round (March 19)…added 16 points with 3 boards, 3 steals, 2 assists and 2 blocks vs. Oregon in Sweet Sixteen (March 25). As a Junior (2015-16): Associated Press and ESPNW Third Team All-American…WBCA Honorable Mention All-American…led NCAA in 3-point FG percentage in 2015-16 (54.5%)…named to the Preseason All-Big Ten Team, the Wooden Award Preseason Top 30, Wooden Award Midseason Top 20 and the Naismith Early Season, Midseason Lists, as well as their finalist lists…started in season opener and scored 22 points with 7 boards, 5 steals, 3 assists and a block (Nov. 14)…scored a career-high 26 points with 10 rebounds for second career double-double vs. High Point, also added 4 blocks and 2 steals (Nov. 18)…scored 10 points with 9 boards, 5 assists, 2 blocks and 2 steals in 22 minutes vs. Detroit (Nov. 20)…named to the Big Ten Player of the Week Honor Roll (Nov. 23)…went 6-7 from the field with 2 threes for 16 points with 3 boards, 5 assists and 2 steals vs. Old Dominion (Nov. 26)…scored 20 points with 6 boards, 4 assists, 3 steals and 2 assists in win vs. South Dakota State (Nov. 27)…scored 16 points with 6 boards, 2 blocks and a steal vs. Pittsburgh (Nov. 28)…named to the Paradise Jam Reef Division All-Tournament Team (Nov. 28)…scored 19 points with 6 boards, 8 assists, 2 blocks in win over #20 Syracuse (Dec. 2)…scored 18 points with 4 boards, 2 assists, 2 blocks and 3 steals in win over CCSU (Dec. 5)…named Big Ten Player of the Week for the Terrapin’s first-ever Big Ten weekly honor (Dec. 7)…led the team with 21 points, 5 rebounds, 3 assists and 4 steals vs. Loyola (Dec. 8)…went 7-12 from the field for 20 points with 3 assists and a steal vs. Southern…also became the 30th player at Maryland to reach 1,000 career points in the win (Dec. 11)…named to the Big Ten Player of the Week Honor Roll (Dec. 14)…scored 10 of Maryland’s first 14 points, went 10-13 from the field for 23 points with 6 boards and 3 steals at UMES (Dec. 20)…fought thru foul trouble for 14 points, 5 rebounds, 3 assists, 3 blocks and 2 steals vs. #1 Connecticut (Dec. 28)…fought through early foul trouble for 13 points, 6 rebounds, 3 assists and a block at Illinois (Dec. 31)…added 16 points with 3 assists, 4 steals and a block vs. #9 Ohio State (Jan. 2)…added 11 points with 5 assists vs. Nebraska (Jan. 7)…led the team with 19 points, 4 rebounds, 3 assists and a steal at #23 Iowa (Jan. 10)…went 5-6 from the field and 4-8 from the floor for 15 points with 7 boards, 4 assists and 3 steals in road win at Michigan (Jan. 14)…went 6-12 from the field for 15 points with 5 boards, 3 assists and 3 steals vs. #24 Northwestern (Jan. 17)…went a career-best 6-6 from outside the arc in the first half for 22 points with 3 assists, a block and a steal at Wisconsin (Jan. 20)…went 5-7 from outside the arc for 25 points with 5 boards, 5 assists and a block in win at Penn State (Jan. 27)…added 16 points with 4 boards and 3 assists vs. Indiana (Jan. 30)…went 17-21 from the field for 41 points, one shy of Marissa Coleman’s program record, with 4 boards, 4 steals, 3 assists and 2 blocks at Purdue…also set Mackey Arena opponent scoring record (Feb. 2)…went 9-9 from the line and 3-3 from three for 30 points with 6 boards, 5 assists, 2 steals and a block vs. #17 Michigan State…71 points in that two-game stretch set Maryland record for scoring in back-to-back games (Feb. 5)…named to Big Ten POTY Honor Roll (Feb. 8)…added 14 points, 7 rebounds, 3 steals and 3 assists at #7 Ohio State (Feb. 8)…went 7-11 from the field and 6-7 from the line for 23 points with 7 boards, 2 assists and 2 blocks vs. Purdue (Feb. 11)…scored 27 points, 22 in the first half, with 8 rebounds, 4 steals, 3 assists and 2 blocks in win at Northwestern (Feb. 14)…added 9 points with 5 boards, an assist and a block vs. Michigan (Feb. 17)…hit 3 threes and went 4-5 from the line for 21 points, 9 rebounds, 2 assists, a block and a steal at Rutgers (Feb. 21)…went 9-12 from the field and 5-6 from three for 27 points with 2 assists and 2 steals vs. Wisconsin (Feb. 25)…scored 19 points with career-high 11 rebounds and 6 assists in win over Minnesota that clinched the Big Ten title (Feb. 28)..,scored 23 points with 8 boards, 4 steals, 3 blocks vs, Iowa in Big Ten Quarterfinals (March 4)…scored 15 points with 7 boards, 5 assists and a steal vs. Northwestern in Big Ten Semifinals (March 5)…notched double-double with 19 points, 10 rebounds, an assist, a block and a steal to be named Big Ten Tournament MOP in Big Ten title win (March 6)…went 10-10 from the foul line for 19 points with 6 boards, 4 assists in NCAA First Round win over Iona (March 19)…added 17 points with 11 boards, 3 assists in NCAA Second Round vs. Washington (March 21). As a Sophomore (2014-15): Started in all games…named to All-Big Ten First Team by both the media and coaches…made first career start and added 10 points with 2 steals in 15 minutes vs. The Mount in the season opener (Nov. 14)…scored career-high 25 points, including 17 in the first half, with 5 rebounds and 3 steals vs. #25 USF (Nov. 19)…added 16 points with 8 rebounds, 2 assists and 2 steals in win at George Washington (Nov. 22)…named to Big Ten Player of the Week Honor Roll (Nov. 24)…added 8 points with 6 rebounds, 2 assists and 3 steals vs. Loyola (Nov. 24)…went 5-6 from the free throw line for 8 points with 7 rebounds, an assist and a block in win over #23 JMU (Nov. 28)…added 5 points, 5 rebounds, 2 blocks vs. Washington State (Nov. 29)…went 7-9 from the field for 15 points with 5 boards, 3 assists and 3 steals vs. Towson (Dec. 7)…scored 23 points with career-high 10 rebounds for first career double-double with 3 assists, a block and a steal vs. American (Dec. 12)…named to the Big Ten Player of the Week Honor Roll (Dec. 16)…scored 17 points off 6-7 shooting from the field with 4 rebounds, 4 assists and 3 steals (Dec. 21)…added 18 points with 9 rebounds and 2 assists vs. Ohio State (Dec. 29)…scored 24 points, including 18 in the first half to carry the Terps, with 9 rebounds, 2 blocks and 2 steals at #16 Nebraska (Jan. 3)…named to the Big Ten Player of the Week Honor Roll for her performance at #16 Nebraska (Jan. 5)…led team with 18 points, 2 rebounds, 2 assists, 3 steals and a block vs. Purdue (Jan. 8)…scored 15 points, 12 in the first half, with 5 boards, 3 assists, a block and a steal in win over #23 Minnesota (Jan. 11)…added 13 points with 3 rebounds and an assist in win at #15 Rutgers (Jan. 15)…scored 13 points with 6 rebounds, 4 assists, 4 steals and a block vs. Illinois (Jan. 18)…added 11 points with 6 boards and 4 assists in win vs. Michigan State (Jan. 22)…added 18 points with 6 boards, 3 assists and 4 steals in win at Indiana (Jan. 25)…scored 20 points with 7 rebounds, 2 assists, a block and a steal in win at Michigan (Jan. 29)…scored 9 points with 5 boards and 2 assists in win over #20 Iowa (Feb. 1)…led the team with 21 points, 5 rebounds, 2 assists and a steal in win at Penn State (Feb. 5)…added 4 points with 7 boards, 2 assists in win vs. #19 Nebraska (Feb. 8)…scored 17 points with 4 assists and 4 steals in win vs. #18 Rutgers (Feb. 10)…went 6-9 from the field for 15 points with 8 rebounds, 3 assists, a block and 3 steals in win at Michigan State (Feb. 16)…scored 17 points with 5 rebounds, an assist and a steal in win at Wisconsin (Feb. 19)…added 9 points with 3 assists and 3 steals in win over Penn State (Feb. 23)…added 16 points with 4 boards and 3 steals in win over Indiana (Feb. 26)…added 11 points, career-high 9 assists and 8 boards in 40 minutes in win at #25 Northwestern to finish 18-0 in conference play (March 1)…added 9 points with 6 boards, 5 assists, a block and a steal in 21 minutes in win vs. Michigan State in Big Ten Quarterfinals (March 6)…added 4 points, 6 rebounds and an assist in win over #24 Northwestern in Big Ten Semifinals (March 7)…scored 13 points, 11 in the second half, with 6 rebounds, 3 assists and a steal in win in Big Ten Championship game (March 8)…added 10 points, 5 rebounds, a block and a steal in NCAA First Round win over New Mexico State (March 21)…added 10 points with 4 rebounds, a block and a steal in NCAA Second Round win over #13 Princeton (March 23)…scored 24 points, 18 in the second half, with 3 rebounds, an assist, a block and a steal in Sweet Sixteen win over #16 Duke (March 28)…scored 12 points with 7 boards, an assist and a block to be named Spokane Regional MOP in win over #6 Tennessee to go to second straight Final Four (March 30)…added 6 points and 3 rebounds in Final Four game vs. #1 Connecticut (April 5). As a Freshman (2013-14): Scored in double figures in 19 of 35 games…named ACC Rookie of the Week in back-to-back weeks (Dec. 29, Jan. 6)…went 4-6 from the field for 12 points with 2 rebounds in 12 minutes in debut at USF (Nov. 8)…added 10 points with 4 rebounds and 4 assists in 22 minutes at Loyola (Nov. 10)…scored 15 points with 4 boards and 4 assists in 24 minutes vs. George Washington (Nov. 19)…went on a 10-0 run herself in the second half with 14 points, 6 rebounds and 3 steals in 18 minutes at Towson (Nov. 23)…went 5-for-8 from the field including two key three’s to stop Drexel…finished with 12 points, 2 assists, 2 rebounds in win over the Dragons (Nov. 25)…went 7-for-9 from the field with three threes for 17 points with 3 steals vs. Texas Southern (Nov. 29). ..grabbed 2 steals with 4 points and 3 boards in 15 minutes in win over Ohio State in Big Ten/ACC Challenge (Dec. 4)…went 5-for-8 from the field for 13 points with 2 boards, 3 steals and 3 assists in 17 minutes vs. Siena (Dec. 9)…scored 13 points with a career-high 7 rebounds in 18 minutes vs. Delaware State (Dec. 14)…went 4-for-5 from outside the arc for 17 points with 3 boards, 2 assists and 2 steals vs. Wofford (Dec. 28)…went 5-for-5 at the foul line for 15 points with 2 rebounds and 4 assists in 17 minutes vs. Charleston…named to Terrapin Classic All-Tournament Team (Dec. 29)…scored 16 points, including 13 in the first half, with 7 rebounds in 26 minutes in win at #10 UNC (Jan. 5)…led team in scoring with three three’s for 15 points with 4 rebounds in 17 minutes vs. Wake Forest (Jan. 9)…came in off the bench and added an instant spark for 10 points with 3 assists, 2 steals, a block and 2 boards in win over Syracuse (Jan. 16)…fought through foul trouble and went 5-7 from the field for 12 points in 9 minutes vs. Georgia Tech (Jan. 19)…added 7 points with 3 assists at Virginia (Jan. 23)…rattled off 9 straight points in a 20-6 first half run for 17 points with 7 rebounds, an assist and a steal in 18 minutes at Syracuse (Feb. 2)…went 4-7 from the field and 4-4 from the foul line for 13 points with 3 boards, 3 assists, a block and 2 steals in 16 minutes vs. Pittsburgh (Feb. 6)…added 11 points with 3 boards, 3 assists, 2 blocks and 2 steals vs. Clemson (Feb. 9)…added 7 points with a key three, 2 boards and 3 assists in 15 minutes at Miami (Feb. 13)…went 5-8 from the field for 11 points with 6 rebounds and 3 assists at Boston College (Feb. 27)…added 8 points with 2 steals and an assist in 16 minutes vs. Virginia Tech (March 2)…added 9 points with 2 boards and 2 steals in 17 minutes vs. #12 North Carolina in ACC Quarterfinals (March 7)…added 8 points with 4 rebounds, 2 assists, a block and 3 steals vs. Army in NCAA First Round (March 23)…added 8 points in 14 minutes vs. Texas in NCAA Second Round (March 25)…added 10 points with 3 steals and 3 boards in NCAA Sweet Sixteen win over #3 Tennessee (March 30)…added 6 points with 6 rebounds and 2 steals in NCAA Elite Eight win at #4 Louisville (April 1).